I try hard not to buy too many things, because it is easy to do so. As it is, I have way more things than I need. But, these new books arrived today from Amazon, and I am so glad that I got them. 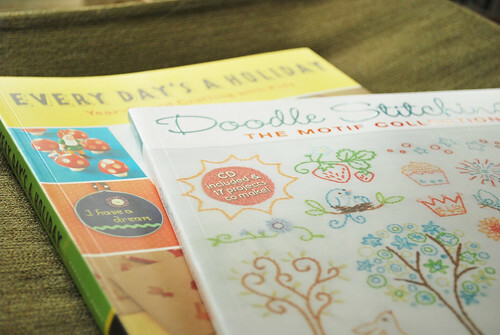 They are both really a treat, and I highly recommend both Every Day's a Holiday and Doodle Stitching: The Motif Collection. It helps that both of these authors are such lovely people. I've had a little bit of email contact with each of them and really, they are so sweet. It makes a difference when it comes to creating. 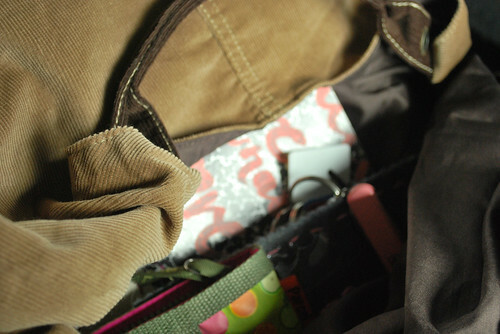 Also new (sort of) is this bag that you get a peek at. I've had it for nearly two years, waiting to embellish it. Last night I pulled it out to add something fun onto it, and today I used it. More coming on this eventually! Do you have anything new that you are loving? Those look like such fun new reads. I'm a sucker for craft books. And yes, I have too many. It's such a pleasure meetin you. Hope you enjoy the rest of your weekend. I've discovered a few new blogs that I'm loving and the little Xmas stitches I'm stitching up as gifts. Ohhhh I love new craft books!!! I bought the Doodle Stitching book too! I kept telling myself I didn't need it, but in the end I did! It's got a cuckoo clock much like yours in it. My doodle stitching book just came in the mail, yay! Like others, I didn't really need it, but... I *needed* it.